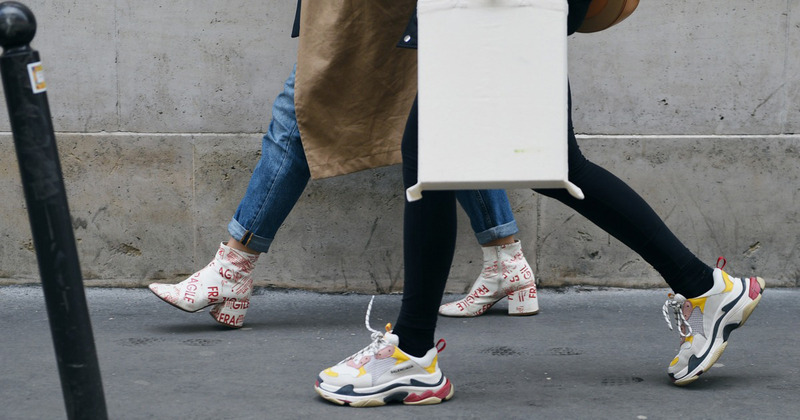 There's been a resurgence of late for an 'ugly shoe' trend. If Christopher Kane and Balenciaga aren't reimagining the Croc, then Kanye West's Yeezy brand is rejuvinating the noughties heeled flip flop for the discerning Millenial. Coloured, printed, chunky and, well, ugly - these shoes are a statement to say the least! They also show no sign of going away. A quick scroll through the new in section on one of my favourite footwear websites, Spartoo, throws up a whole host of the 'ugly is the new pretty' styles. Crocs, Moon boots, Birkenstocks, heeled Timberland boots (very J-Lo) Dr Marten dolly shoes, shearling lined rubber boots and dad trainers from Skechers are just a few of the options available to those who want to uglify their shoedrobe! Personally I like the idea of an ugly shoe, or a statement shoe at least! After a couple of seasons of 'normcore' styles (plain white trainers, simple black boots) something a little less conformist is exciting and refreshing.